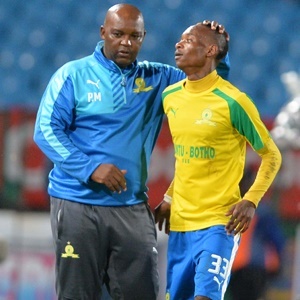 Cape Town - Mamelodi Sundowns forward Khama Billiat says his brace in the 2-0 win over Champions Bidvest Wits was down to the tactical instructions of coach Pitso Mosimane. After being left out of the starting XI in their last two league fixtures, the Zimbabwe international marked his return with an impressive two-goal haul. Both goals came in the second-half, with the former Ajax Cape Town man showing real positional awareness to finish off Percy Tau and Hhlompho Kekana's pinpoint passes. "When you're sitting on the bench you're always listening to the coach giving instructions so when you go in you don't have to make the same mistakes," he said after the game. "We played as the coach said to always be in between the defenders and that was a good pass from Percy (Tau) and also a good pass from Hlompho (Kekana)." With Billiat and striker Leonardo Castro set to leave the club upon the expiry of their contracts, Mosimane confirmed the Brazilians are on the lookout for replacements. "I left him on the bench because the team that started against Orlando Pirates the last time (a 3-1 victory at Orlando Stadium) played well, not because of the contract situation," Mosimane said. "But if you want news on that, Khama is leaving. "We have our people in South America because (Leonardo) Castro is also leaving. This means the CBD (the deadly combination of Castro, Billiat and Keagan Dolly, who went to France in January last year) has officially been dismantled."